Smart Curtains are a movable space separation system that provide visual separation, thermal barriers, and light to various living spaces throughout the live/work environments of Soft House in Hamburg, Germany. The system consists of modified, repeatable, and electrified curtain track segments, custom designed hangers and power trolleys which supply power and data LED lights attached between the double layered aluminum fabric. 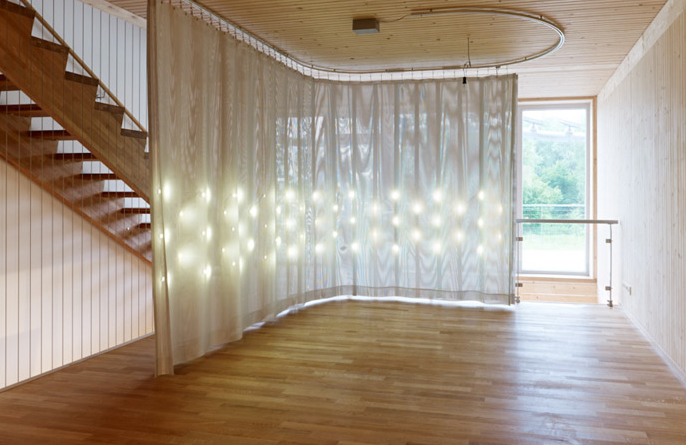 While the curtain can be positioned to alter living spaces within the house, the LED lights bring the external environment into the house by flickering on and off as a function of the windspeed outside. Architecture Firm: Kennedy Violich Architecture. Design Team: See firm's website.